It's hard to think of Somalia without envisioning vicious pirates and murderous chaos, African-style, at its worst. Since the collapse of its government in 1991 and the subsequent failure of any government to take hold of the land, every single piece of corporate media that reaches us in the West about Somalia reinforces this image. Somalia has no government: the horror of it all! This non-stop media onslaught against what is probably the modern world's largest contiguous anarchic region serves a purpose. The giant multinational corporations which control that media (and most industries in general) require constant government interference with the free market, in order to save them from competition from lean, efficient young upstarts. The State is their lifeline against the hyper-democracy of pure capitalism, in which survival in business depends not on controlling a few regulators, but in pleasing the market (us). The mega-corporations must continually remind the people that they need the State in order to survive. If we were ever to figure out en-masse that we don't need our parasitic rulers, the corporate gravy-train would end. So it's no surprise that the true story in Somalia is not actually proof that anarchy doesn't work. On the contrary, the truth is that Somalia is proof that anarchy does work. Somalia under anarchy is by the vast majority of measures far superior to Somalia under State. Naturally, the astrological charts of both Somalias reflect this. The chart for the day of the founding of Communist Somalia is clearly authoritarian: extremely so. Pallas' ruler Saturn receives a sesquiquadrate from the South Node and a quindecile from Jupiter. Venus, which is quincunx Saturn, is conjunct Pluto. Jupiter is also contraparallel Pallas. We have all three factors (Jupiter, Pluto, and the South Node) which can block the Palladian non-aggression principle. The wide opposition from the Sun to Saturn is not much help here. 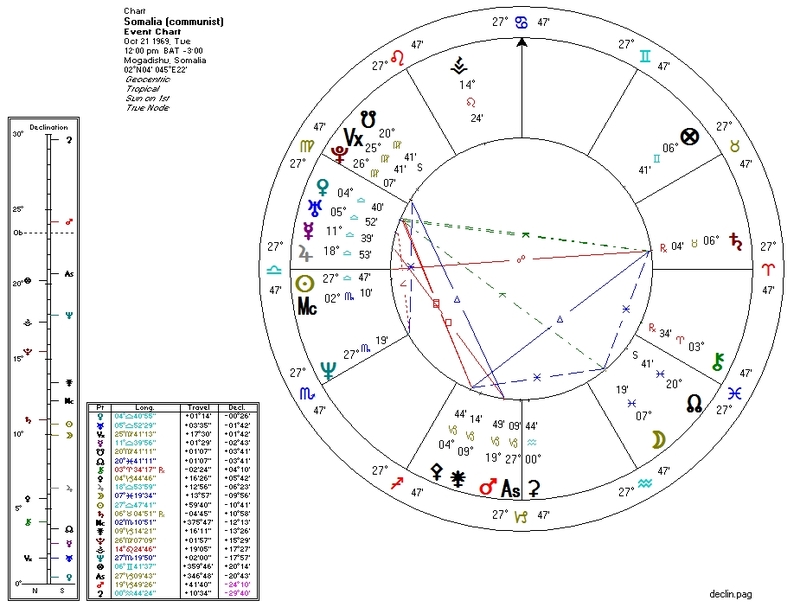 Even without an exact time of "birth", Left-wing economics are evident: Neptune is dead-on the cusp of the solar Second House. This fully befits a Communist regime, centered on the liquefaction of personal wealth. 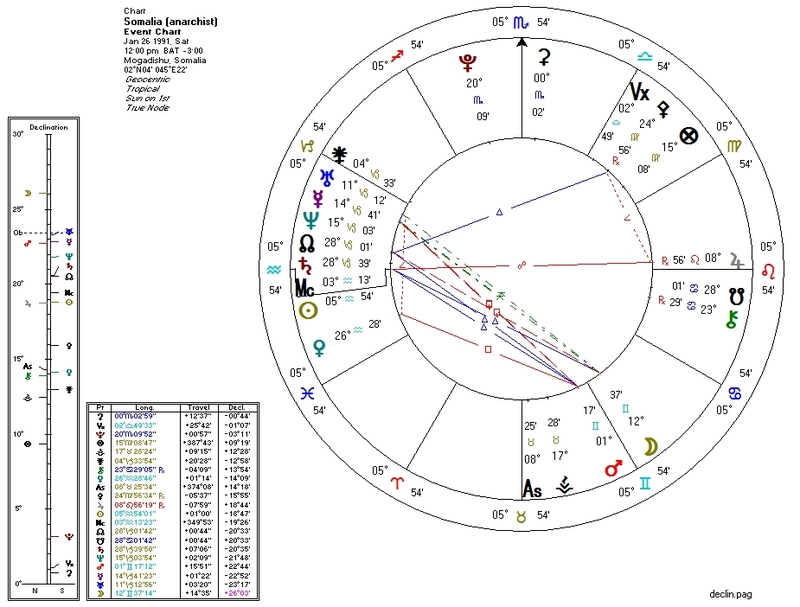 Completing the Bloodbath Formula is Pluto conjunct Venus, which also rules the Sun. Here is a chart for the day of the overthrow of Somalia's brutal Communist regime, after which no other regime has been able to assert dominance. On the not-so-great side, Pallas is semisquare Jupiter and her ruler Mercury is quindecile with the South Node. These negatives are likely obliterated by the trine from Pallas to the North Node. This chart agrees with the alt-media reporting from Somalia: while it's no paradise, the people of the land are measurably better off without government. If allowed by the US to continue as a stateless society (not likely, but one can dream), it may show us a thing or two.